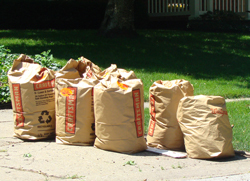 (Omaha, NE) — “No exceptions, yard waste left at the curbside now, will not be collected,” that is the voice-mail message left on the city of Omaha wasteline phone line today. The issue has arisen because ECC homeowners, have left brown yard waste bags at the curbside in hopes of pick up today. So, the option appears to either dispose of the bags of leaves, branches & other dead foliage another way – OR, store the bags in the garage – where it certainly may end up causing an unpleasant smell. Next ECC HOA Easter Egg Hunt!